All facials start with a consultation, to make sure you have the correct products used for your skin type. You will have the opportunity after the facial to discuss aftercare with your therapist, and to ask for information on home care products, should you wish to purchase any. A cleanse tone and moisturise, with specially selected products for your skin type. 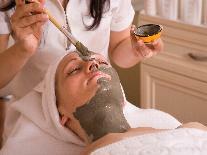 Relax and enjoy a facial using specially selected products for your skin type.